Each year, many lives are claimed by drivers who recklessly text while driving instead of paying attention to the road ahead. The recent incidents induced new technology like the speech-to-text Siri, among others, to help drivers focus on road rather than diverting their eyes to their cellphones. Still, the added convenient only helps drivers who are already accustomed to the texting while driving habit find a new alternative. 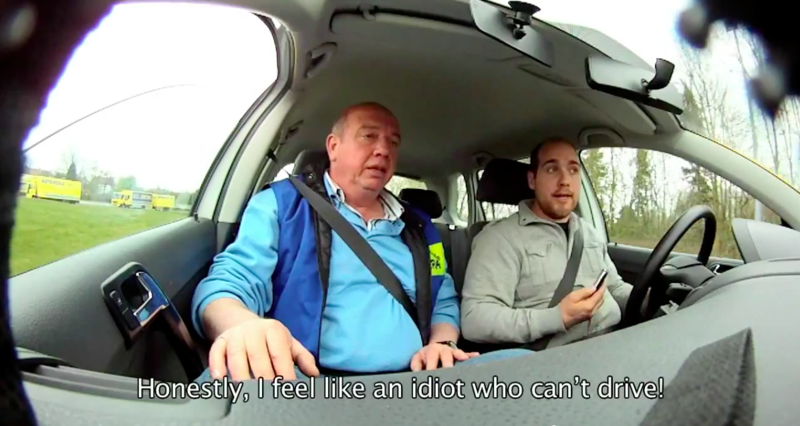 To give new drivers a first-hand lesson on how dangerous the activity could be, a non-profit in Belgium is taking students on road tests and making them text as they drive in order to get their license. The organization Responsible Young Drivers took new drivers, young and old, and pretended to show them a new required law that drivers must prove they can text while drive before obtaining a license. Naturally, this freaked out a bunch of the students. Dubbed as “The Impossible Texting And Driving Test,” the instructor is seen yelling at the students to make sure they are texting and spelling correctly, all while keeping their vehicle in check. The obstacle course is also set in a rather difficult pattern, with cones, twists, and turns along the way to make the experience even more demanding of the driver’s attention. Thankfully, no other cars were in sight for the students to royally mess up upon. “Imagine that’s a child,” the instructor tells a student who’s run into an obstacle. If this doesn’t prove to them how hard and dangerous texting while driving is, we’re not sure what will. “If this becomes law, I’ll stop driving,” another agitated student claims. As you can see in the video below, the tests hardly result in safe driving. Even though both passengers are wearing seat belts, they are seen tossed around the vehicle as the driver attempts to text and maintain road speed. In some sequences, the instructor is without a seat belt and seems to exaggerate the impact a bit just to freak out students even more. You don’t have to experience first hand to know how dangerous this activity could be despite the fact that not all states enforce a strict policy on texting while driving. If you’re taking the driver’s seat, be sure to focus on the road and leave the drinking, texting, adjusting of temperature and radio knobs, et cetera to your shotgun passenger and be safe. It’s more than just your life you could be saving!